There are, of course, in the pursuit of science, all the classical reasons that stress the importance of theory. These will not be elaborated here because many do not apply to a field of work such as health promotion. Theory is probably most needed in order to help set the parameters for a scientific discipline, rather than a field of activity such as health promotion. Nonetheless theory serves a critical role in the conduct of most any activity and health promotion is no exception. Most critically, theory helps one avoid two types of error, one a narrow empiricism that concerns itself only with observation and the undirected collection of data and two an outlandish unanchored abstract thought that tries to address the entire range of understanding of the meaning of life. Health promotion practice is full of interventions, particularly at the community level, that are not anchored in any systematic theoretical approach. 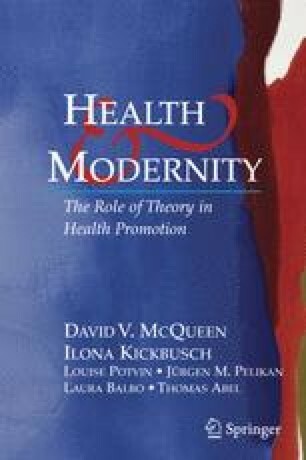 At the same time large conceptual ideas that are discussed in health promotion are equally found wanting an underlying theory. Finally theory anchors explanations in a field in the rich contextual efforts of many others who have thought long and hard about why social life is the way it is. A prime example is the discipline of sociology where a theoretical tradition has provided a rich source of explanation for phenomena ranging from socioeconomic status to globalization. To date there is no equivalent to this rich tradition in the field of health promotion. We have to create it.